We are pleased to inform you, that the journal JIPFRI (Jurnal Inovasi Pendidikan Fisika dan Riset Ilmiah) has become a journal accredited by the Ministry of Research, Technology and Higher Education based on Number SK 3/E/KPT/2019 about the Results of Scientific Journal Accreditation in Period 1 of 2019. Defined as an accredited scientific journal ranked 4. Accreditation is valid for 5 (five) years. Call for Paper => Volume 3, 2019. JIPFRI (Jurnal Inovasi Pendidikan Fisika dan Riset Ilmiah) has been published in Vol. 2 No. 2, November 2018. Our hope with the publication of this journal can help readers to provide insight, ideas, references, in the development of educational innovations and scientific physics. This journal review contains 7 articles. 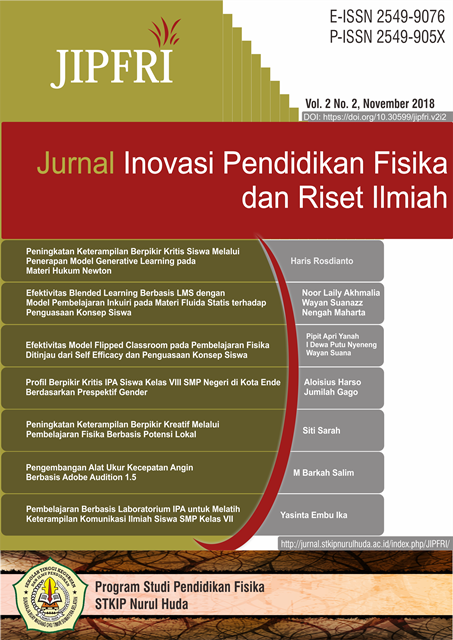 JIPFRI (Jurnal Inovasi Pendidikan Fisika dan Riset Ilmiah) is a scientific journal published with a view to facilitating academics and researchers to publish their research results in the field of Physics Education Innovation and Scientific Research in the field of physics. Jurnal Inovasi Pendidikan Fisika dan Riset Ilmiah (JIPFRI) is a journal published by Program Studi Pendidikan Fisika STKIP Nurul Huda. JIPFRI began to appear in May 2017 that is Vol. 1 No. 1 the year 2017, with and periodically published twice per year in May and November. Innovation Physics Learning: model, strategy, approach, development of teaching materials and media in physics learning. Scientific research: physics experiments and physics development research, usually the type of quantitative research. Philosophy of science: profound scientific thoughts and have an acceptable reference, usually the type of qualitative research. JIPFRI (Jurnal Inovasi Pendidikan Fisika dan Riset Ilmiah) has become a CrossRef Member since the year 2018. Therefore, all articles published by JIPFRI will have unique DOI number.